This circa-1785 Montgomery County, Pennsylvania, shrank is one of the finest in private hands, retaining its original vibrant paint scheme. The two painted dome-top boxes are by the “Compass Artist.” They were produced in the Lancaster County area of Pennsylvania, circa 1800–1840; a third box by the same artist is elsewhere in the collection. The yellow-painted box with tulip tree decoration is in Index of American Design (1935). All were purchased from Olde Hope Antiques. The eagle and flag wall plaque is by George Stapf (1862–1958), Harrisburg and Lancaster, Pennsylvania. The painted flag plaque, mounted over the fancy chair, may have originally been used in parades. The 1853 farmhouse originally belonged to the family of William B. Travis (1809–1836), a commander at the Battle of the Alamo during the Texas Revolution. he gaze of Steven Austin (1793–1836), known as the “Father of Texas” for his role in the colonization of the Lone Star State, is fixed on a wall of Texiana diagonally across the room from where his portrait hangs in this rural farmhouse. Among the ephemera on display is a discharge signed by Samuel Houston (1793–1863), who, as commander-in-chief of the Texas armies, secured the state’s independence in 1836, one of many distinguished accomplishments. 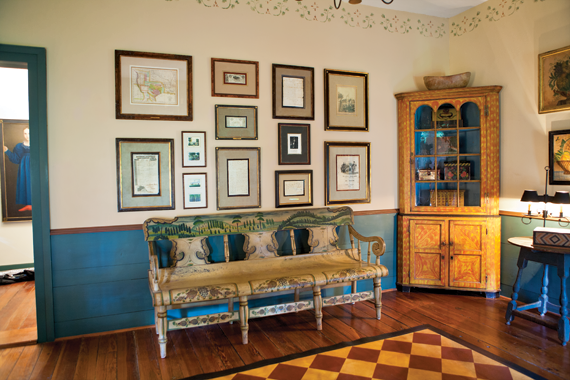 Documents and maps that chronicle Texas history, from the pre-republic period of the 1820s and 1830s to when it gained statehood in 1845, cover the wall; documents in another room relate to the Spanish exploration period of the seventeenth and eighteenth centuries. The couple who brought this historic material together has been collecting for four decades and, like most people who live in the state, are proud of what it means to be a Texan. 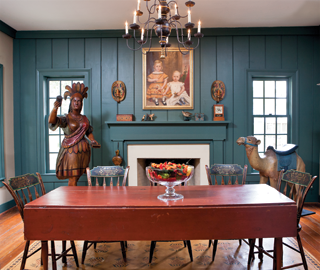 Painted fancy chairs are set around the original red-painted, circa-1820–1840 harvest table, which dealer Marguerite Riordon used in the dining room of her home. The circa-1840–1860 portrait of two young boys hangs above the mantel, on which there is a paint-decorated box, Schimmel eaglet, and carved dog and pigeon. The carver of the Indian trade figure worked for Samuel Robb (1851–1928), whose influence is evident in the treatment of the feathers, the forward motion of the arm, and the attire, which “hangs” longer in the back. The couple’s grandchildren have named the figure “Buttercup.” The camel is attributed to carver Charles Looff (1852–1918), the earliest carousel carver on Coney Island, New York. 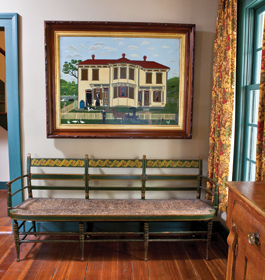 Splitting their time between their homes in Houston and the countryside, the couple says that when they walk through the door of their country home, “it makes us feel good to be in a relaxed setting surrounded by our antiques.” The original four-room house was built in 1853. 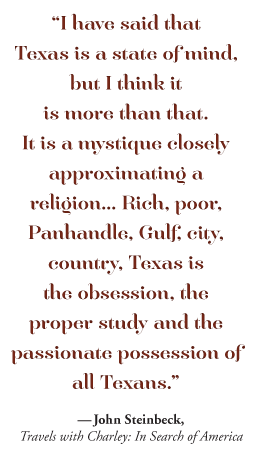 It was preserved and moved to its present location in the 1970s by the sister of pioneer Texas collector and historian Faith Bybee (1900-1996). As part of her interest in the cultural and historic heritage of Texas, she also relocated the house next door and lived in the inn across the street. Subsequent owners added more rooms and a porch out back and renovated the interior. During outings to antiques shows the couple had driven by the location many times, wistfully thinking how much they would enjoy living in the house. One day when they saw a “For Sale” sign, they promptly pulled into the driveway and purchased the property. This glove box from Ohio is the best of three known examples; one other is in The Met and a third is in a private collection. The couple was drawn to the primitive imagery of this circa-1880 house portrait, which dealer David Wheatcroft found for them in Ohio. The fancy settee, probably from New York, retains its original paint and rush seat. The Pennsylvania fraktur are arranged for maximum visual effect. Among the couple’s favorites is the presentation fraktur by Johannes Setzer (n.d.), Hamilton Township, Northampton County, Pennsylvania, dated 1820 (center). The precision with which the trees are rendered results in a mirror image. The kitchen is simply decorated. 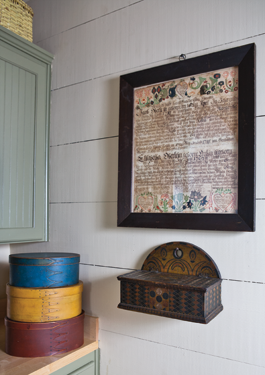 In one corner, a 1786 marriage certificate hangs above a circa-1820–1850 carved and painted hanging box from Somerset County, Pennsylvania. Three stacked and painted boxes are showing their “swallowtail” joints distinctive to the Shakers. 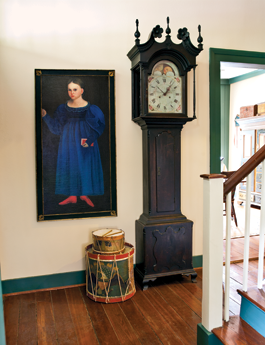 The foyer is dominated by the Montgomery County tall clock with dial signed “Adam Brant.” Purchased in 2008 at the Richard and Rosemarie Machmer sale at Pook & Pook, the husband was delighted to find the clock illustrated in Wallace Nutting’s Furniture Treasury (1928). Typical of Montgomery County clocks in its oversized bonnet and distinctive carved elements, the clock is also notable for its untouched finish. The hall extends from the front door through the back, allowing for gentle breezes during the hot Texas summers. A candlestand attributed to the Dunlap shop in New Hampshire cozies up to a single-door New York cupboard with hand-carved pegs, circa 1830–1840. Yellow and blue firkins sit with painted baskets on top of the cupboard. 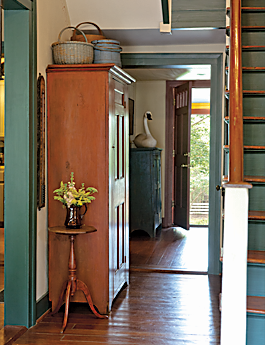 In the background, a swan decoy from Charleston, South Carolina, adorns a blue-painted jelly cupboard. The naïve painting of a young girl is illustrated on page 74 of Alice Ford’s Pictorial Folk Art, New England to California (1949). “It is a beautiful picture,” says the wife. “The blue and the red just jump out at you.” The large Civil War-era drum is labeled “Wm. H. Horstmann & Sons., manufacturers and importers of military goods, Third Street, Philadelphia.” The small child’s drum is from the centennial era. The couple was drawn to the tobacco figure because of her pleasant rather than the more usual stern face. As with the other trade figure in the collection, this one is attributed to the shop of New York carver Samuel Robb. The chair table is of an unusual large size, with an early red paint. The blue-painted box with slide lid is decorated with tulips and the initials “AF”; it is dated 1764. The white Windsor, purchased from James and Nancy Glazer, is one of the husband’s favorite pieces. It is illustrated in Charles Hornor’s Blue Book, Plate 467. 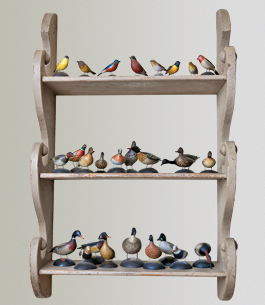 In the corner, a blue-painted lift-top child’s desk is surmounted with a carved bird tree from the Machmer collection, illustrated in Just for Nice (1993), over which two painted game boards hang, one dated 1844. 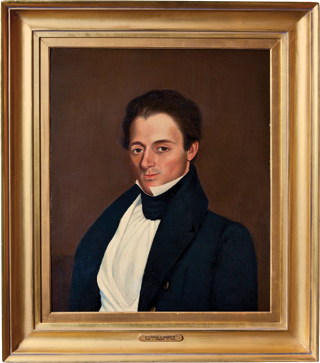 The circa-1820 portrait of Steven Austin, the “Father of Texas,” was probably painted when he was a judge in Arkansas prior to his coming to the Lone Star State. The first dealer with whom they worked on a regular basis was the late Kathryn Newton, who had a shop in Brenham, Texas, about forty-five minutes west of Houston. Her shop was packed with antiques, with a little pathway between the stacks of material. “It was great,” they say, “and we still own the things we bought from her.” The couple then met Myrtle Eull, who had a shop in Houston, and who also helped train their eye. The panoramic painted scenery of the mid-nineteenth-century settee reminds the couple of wall murals by Rufus Porter. Purchased from the Dr. & Mrs. Donald Shelley Sale in 2007, the settee is attributed to William F. Snyder, Mifflintown Chair Works, Juniata County, Pennsylvania; it is inscribed “A. B. Hart” on the underside. Mounted on the wall above are some of the couple’s ephemera relating to early Texas history. 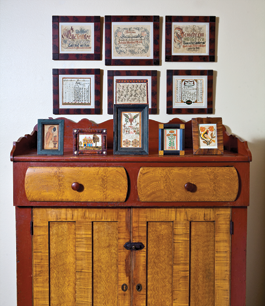 The circa–1830s feather grain decorated Pennsylvania corner cupboard arrived from David Wheatcroft only days before the photo shoot and fit perfectly in the space. The burlwood bowl is from Leigh Keno’s personal collection. He had brought the bowl to his shop when he was taping a television show. The couple saw it and couldn’t get it out of their minds, so they were delighted when they were able to acquire it. To the right, two theorems on velvet; the one on top is from the Edith Halpert collection. The circa-1740–1760 Philadelphia blue-painted table has a wonderful splayed stance. 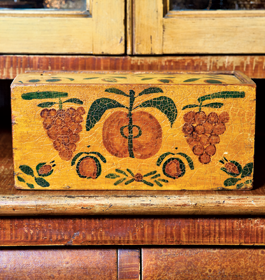 The painted box, from the Dittmar collection, is dated 1782 and inscribed for Elizabeth Weber. The appeal of this box is that the top is decorated like a fraktur. 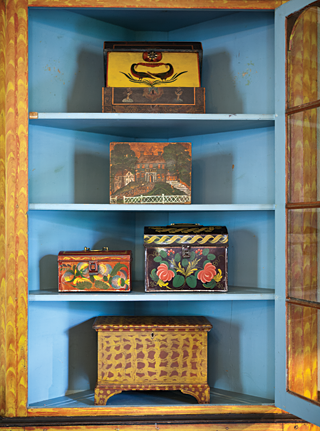 The decorated boxes create a vivid display of color. Their origins range from New England to Pennsylvania, and are either painted wood or toleware. Among the most prized is the York County box on the bottom. At the booth of Patrick Bell and Edwin Hild of Olde Hope Antiques they saw a circa-1785 Pennsylvania painted shrank from the Sandy and Julie Palley collection and fell in love with it, never thinking they would be able to own this important example, which had set an auction record when purchased for the Palley’s at a small country sale. Six months later, the husband, who could not stop thinking about the shrank’s pristine paint and imposing form, called Patrick and Ed and negotiated the purchased of the shrank; it now holds center stage in the couple’s dining room. The splashboard of the circa-1840 Southern Lancaster County, Pennsylvania, cupboard, with original red and yellow grained finish, provides a decorative backdrop for a group of small watercolors from Southeastern Pennsylvania, dating from circa 1800 to the 1830s. The motifs on these colorful images include tulips and birds. One image relays the early Christian story of the pelican piercing its breast to feed its young; a similar example is illustrated in American Folk (2001). A portion of the twenty-three Vorschrift in the couple’s collection hang on the wall above the cupboard. 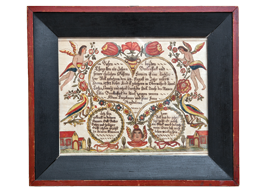 Ed Hild from Olde Hope notes that the husband has a very selective eye when it comes to fraktur as shown in the two rare examples pictured above, a blend of folk art & fraktur drawing. 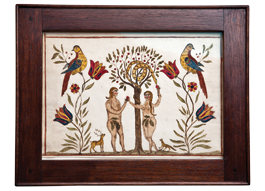 LEFT: An Adam and Eve fraktur drawing, watercolor on laid paper 7 x 9-3/4 inches. Schwenkfelder Community, Montgomery County, Pennsylvania. RIGHT: A rare Taufschein for “Litia Berckenstock, 1797” attributed to Durs Rudy Sr. (1766–1843). Watercolor on laid paper 7-5/8 x 9-5/8 inches. Lehigh County, Pennsylvania. The stacking of chests is done for aesthetics as well as to save space. From the largest to the smallest, they are from Preystown, Pennsylvania; Virginia; and New England, respectively. 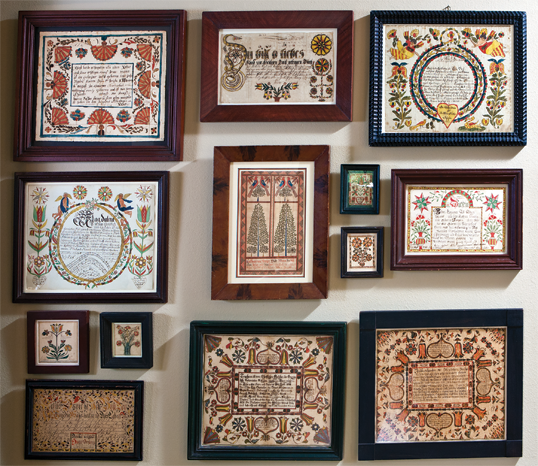 The fraktur on the wall consist of bookplates, family records, birth and baptismal certificates. BELOW: “This is one of our favorite pieces,” says the wife of the yellow painted dressing table with free-hand and stenciled decoration. “When you live with something and use it regularly, it becomes more personal,” she adds. The miniature on the left is a rare signed portrait by Philadelphia folk artist Charles F. Berger; the one on the right is by Mrs. Moses B. Russell. 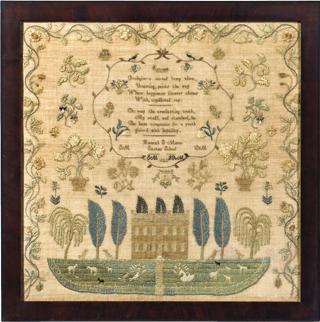 The sampler is worked by Anna Caroline Boyer, dated 1839, Easton, Pennsylvania, with the appealing strong color, composition and pictorial images found on the best Pennsylvania samplers. 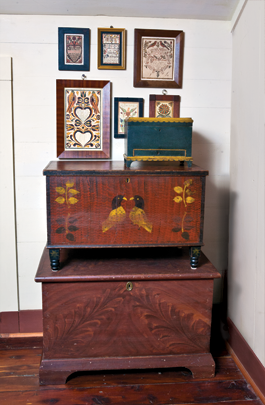 The Mahantongo Valley chest was in the collection of Henry Reed, author of Decorated Furniture of the Mahantongo Valley (1987). 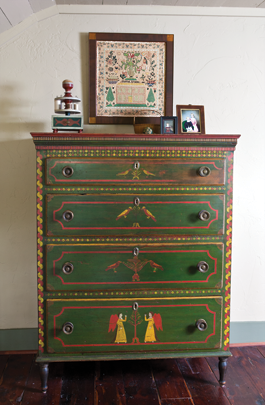 While the color palette of green with red and yellow detailing is distinctive to the region, the presence of painted birds and angels is among the rarer combinations. “I love the small items,” says the wife, referring to such objects in the collection as the sewing box and Nantucket basket seen here. “I find them the most intriguing.” The portrait miniature of a child from the Orne family of Salem, Massachusetts, is one of the couple’s most recent acquisitions. The double portrait is by Mrs. Moses B. Russell. The sampler, worked by schoolgirl Harriet Arnold, is dated 1828 and has its original ribbon edging. Amy Finkel believes it is one of the best known from Reading, Pennsylvania. Needlework by Hannah E. Moore, Easton School, Burlington Co., New Jersey, done in 1822. An extract verse within a cartouche appears above a fine house and the lawn is populated with many sheep and a large swan, all classic motifs taught at Quaker schools. Amy Finkel describes it as a very important sampler from a highly regarded Quaker school. 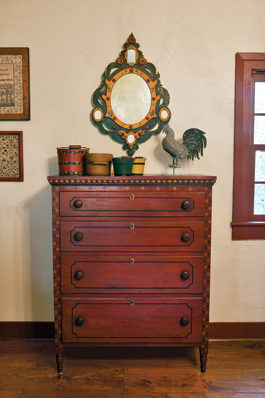 This is the second Mahantongo Valley chest in the collection and was in Winterthur Museum when author Henry Reed included it in his book Decorated Furniture of the Mahantongo Valley (1987). The color schemes of the folk art mirror, J. Howard & Company rooster weathervane, Shaker berry buckets, and Lehnware water bucket complement the chest and create an appealing visual image. 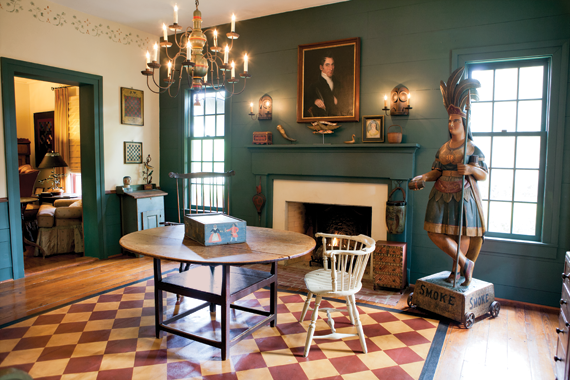 Olde Hope Antiques sold both Mahantongo chests to the couple, as well as the weathervane and buckets; the mirror is from Jim and Nancy Glazer. 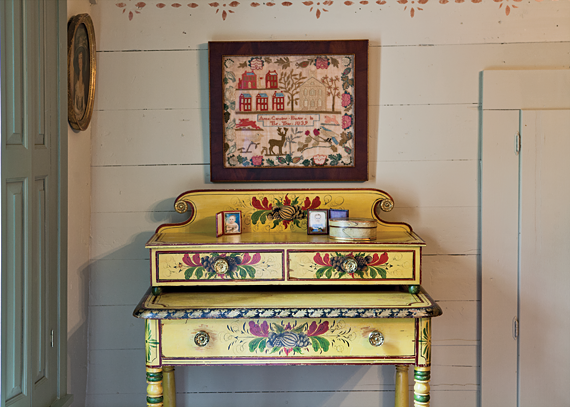 The red- and yellow-painted chest is one of the best of a small group from York County, Pennsylvania. 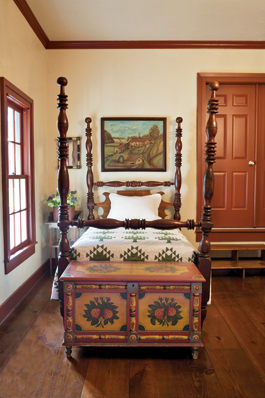 Though most of the furnishings in the collection are from Pennsylvania, the couple was delighted to locate this bedstead, made in Burton, Texas. The 1909 farm portrait by F. P. Bodwell represent’s the artists home in New York State as it appeared in the 1830s. A legend on the reverse identifies elements in the work. The washstand is a visual delight, with faux graining, dots, and swirls. The collecting advice the couple offers is to “work with a select group of dealers whose judgment and ethics you trust.” Because each dealer has a particular style, they say, a collector absorbs something from each, resulting in a richer overall aesthetic.